Race 1: A week of ‘light and variable’ forecasts with thunderstorms held off for Saturday, which turned into a quality day of short, fast races. Competitors were greeted in race 1 with an easterly 5-7mph breeze for the start of a 2 lap triangle course followed by a beat to the finish. Racers got away cleanly and Mark Schnieder (LE-66), James Byrne (HO-59) and Pat Flinn (HO-54) all rounding the windward mark stacked tightly. Schnieder got the kite up first and snuck away from the group. The fleet compressed and expanded with each puff coming through the course with Brian Gabriel (T-53) made the most of the flukey breeze. The wind faded out as the leaders reached the finish but Gabriel ghosted across the finish line first followed by Flinn who snuck past Schnieder on the last beat. Race 2: The breeze began building as the day went on and the race committee switched to a traditional 2 lap windward-leeward course. The course was particularly crowded as it was set running across a narrower part of lake between two coves and was shared with 18 Thistles. Gabriel’s boat speed was on display and he lead wire to wire. Schnieder finished second in race 2 followed by Flinn. Race 3: The velocity continued to build, with puffs reaching the low teens scattered among lulls with wind speed below 5mph. Major wind speed changes coupled with large shifts in directions made for the close and hairy racing with a few big collisions and some capsizes. The committee added a lap to lengthen the course for the third and final race of the day. Gabriel was able to connect the dots and walked away from the fleet for his third bullet of the day. Flinn followed in second, holding off a hard charge by Doug Johnson (T-15). Saturday Evening featured post-race appetizers and a dinner at the club. 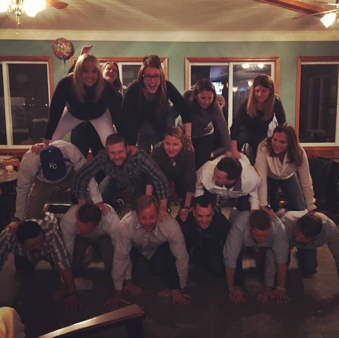 Two kegs were drained and the perennial ‘Brett Douglas Birthday Pyramid’ was in full swing! Day Two, Race 4: The wind shifted to the north for race 4 on Sunday morning and was a very soft 3-7. A 2 lap course was set running the length of the main lake. Boat speed was key with the course now running vertically up lake. Gabriel showed he could keep the boat going in the light stuff to lead at the windward mark and extended little by little on each successive leg. Schnieder and Flinn battled for second and traded positions for the entire race with Schnieder crossing ahead of Flinn on port just a hundred yards or so before the finish to seal up second for the race. Race 5: With the course and wind speed unchanged from the previous race, Gabriel attempted to finish out the regatta sweep while Schnieder and Flinn entered the final race of the regatta one point apart for second. After needing to loop around the pin at the start, Schnieder raced off to the port side of the course and hooked into a strong left shift that vaulted him past the fleet which was stuck in a lull further to the right. Gabriel followed at the windward mark followed by Johnson and Byrne. Flinn was able to scoot up into third on the run, behind Schnieder and Gabriel. Byrne and Gabriel worked the right side of the beat with precision and made up significant ground on Schnieder on the next beat, establishing a significant gap on the rest of the fleet. In the final moments of the run, Gabriel and Schneider got into a tight gybing battle and almost let Byrne sneak in for the victory. But it was Gabriel’s weekend to win and he reclaimed the lead by a half boat length in the final moments to secure his sweep of the regatta. Summary: The weekend turned out to be a fantastic tune-up weekend for the fleet with several sailors able to iron the wrinkles out of their ‘new’ boats. As always, it was a pleasure having our counterparts up from the saltier bodies of New Jersey. T-53 crew Will Demand was helpful as always and offered up a wealth of information to the local Hopatcong boats on rig tuning, boat set up, and handling tips before the races. We also need to send a shout out to our Thistle counterparts in their “Kitchin Memorial Regatta”. A. Lloyd Kitchin, Jr. passed away in the month prior to the regatta and left three generations of sailors behind. In his honor, his three grandkids, Skipper Brian Kitchin, crew Jess Kitchin and Doug Kitchin were able to nearly sweep the Thistle regatta with four firsts for emotional trophy presentation. Mr. Kitchin was a staple of the Lake Hopatcong Yacht Club for over 90 years and will be sorely missed. 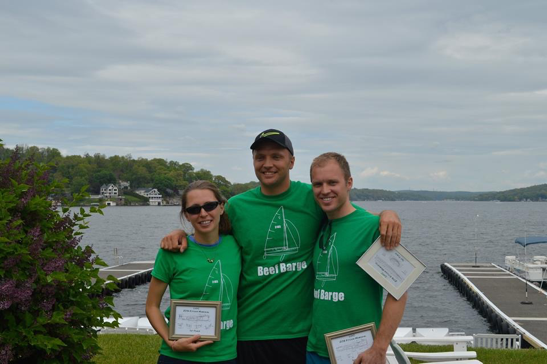 Lake Hopatcong will be hosting the Eastern’s Regatta this summer and looks forward to hosting a fleet of 35-40 boats for what will surely be a fun event.